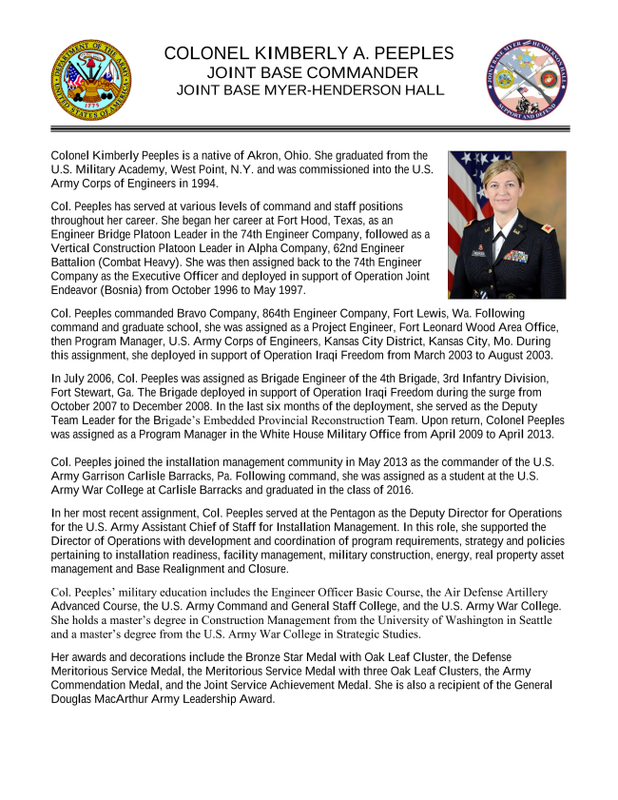 The Arlington County Civic Federation is pleased to announce that Col. Kimberly Peeples, Commander of Joint Base Myer Henderson Hall (JBM-HH), will be our featured speaker at the 2019 ACCF Annual banquet on Friday, April 5. For the first time, the annual CivFed banquet will be held in the Koran Room at JBM-HH Patton Hall, formerly the Fort Myer Officers Club. As a pitch perfect note to the banquet, plans are to have members of “Pershing’s Own,” the prestigious U.S. Army Band, provide music during the banquet’s social hour starting at 6 p.m. The banquet and program follow at 7 p.m.
“Col. Peeples and JBM-HH are wonderful neighbors to invite the Civic Federation to celebrate our 103rd anniversary at their ‘home,’” said CivFed President Duke Banks. “And we are particularly delighted that Col. Peeples’ speech will focus on the many ways that the command has been an important neighbor and friend to Arlington County.” To learn more about Col. Peeples use this link. In addition to Col. Peeples’ address, the program will include presentation of the 2019 Sun Gazette Cup and ACCF President’s Award. The names of those who register for the banquet by March 29th will be given to the guards at the 2nd Street Gate. This will facilitate their access to Joint Base Myer-Henderson Hall. They will also be emailed a pass that can be be downloaded, printed and placed on their dash board. This will pass also will facilitate their access to Joint Base Myer-Henderson Hall. Those who register after March 20 will have to fill out forms at the gate to get on the Post.